Multiple input validation vulnerabilities in the windows kernel allow random code execution though the GDI component (WMF and EMF files yet again), and privilege escalations that allow random code to be run in kernel mode. Secure Channel (SChannel) implements SSL and TLS. When using client certificates (X.509) the server implementation fails to properly validate that the client has access to the private key and allows impersonation using only knowledge of the public key of the client. Replaces MS08-037, MS08-034 and MS08-066. CVE-2009-0093 and CVE-2009-0094 are publicly known according to Microsoft. CVE-2007-5355 and security advisory 945713 are unrelated (and remain unfixed). Roseman wrote in with a pointer to a techrepublic blog that points out the well known danger to the short URL servcies and their widespread use. Bit.ly has an add-on for firefox that allows you to see where the URL points to in addition to some statistics. Those measures reduce some of the dangers, but by far not every danger of users being used to click on links they receive via twitter, IM, or email. It's still far safer to go to any place you need to log in such as e.g. your bank via a bookmarked link only. Those bookmarks reduce the phishing attempts emailing you funny URLs, the typo squatters etc. Add in a properly working certificate on the SSL version of the website and you've got some serious defense going as a user as long as you do not accept bad certificates. There are more generic plug-ins for this for Firefox, suggestions we received include "Long URL Please", and "LongURL Mobile Expander". Use at your own risk. TinyURL has a manual version of the preview: change http://tinyurl.com/X into http://preview.tinyurl.com/X . Make sure you have version 9.1. Updated versions for unix and older versions (versions 7.x and 8.x) will be forthcoming in the next weeks according to Adobe. (*): normally we credit it to the first one to write it, but I lost track of who was first, so all of those that allowed their name to be mentioned get the mention. 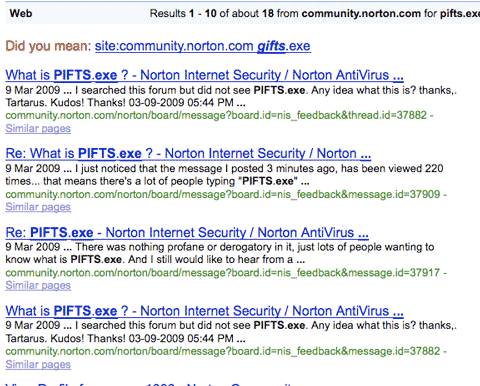 Several readers wrote in with samples of a file PIFTS.exe that seems to be related to a Norton update and gets flagged for its behavior. The file has been confirmed to call home to stats.norton.com . This is of course exactly what any conspiracy theorist needs to lower trust in the products. We're trying to reach our contacts at Symantec for an explanation, and will update if and when we get a response. I just had a phone call from a Symantec employee confirming the program is theirs, part of the update process and not intended to do harm, more to follow, stay tuned. Take care if you search for this: you might find the bad guys out there taking advantage of our interest in PIFTS.exe already. At the time of writing the page we were notified about was not (anymore?) indexed in google, but YMMV. From interactions with Symantec staff and the public post, it's safe to conclude the intention of PITFS.exe was to gauge impact on upgrading old versions of the software (even dating as far back as 2006 and 2007). Of course there are lessons one can learn from it, even if you were unaffected, you can learn form it. But also ask if you'd do better yourself when you are faced with it. Responding to such incidents isn't easy. In hindsight it's easy, on the spot it is much harder. I'd like to thank the Symatec contacts who did respond to my inquiries in a time of crisis for them. So thanks! Same origin policy is a way a browser keeps methods from being called between different sites. It assures that www.evil.com's scripts can't access www.bank.com's methods, even if you have both of them open in the same browser at the same time. Any failure here often is catastrophic to security. Transparent proxies sit between the browser and the Internet and -as their name suggests- transparently try to either cache some content and safe some bandwidth or either are there to inspect traffic and/or enforce policies. They are supposed to be invisible to the browser. You'll find them at hotels, ISPs, corporate perimeters etc. There are quite a few security technologies that incorporate them to do content filtering. Browsers typically have plug-ins such as a flash player that have extensive scripting capabilities (or java). These plug-ins can open TCP connections themselves. As you're probably getting by now: the above combination can have a problem depending on how the transparent proxy is working. Last month CERT released a not much published about vulnerability note, that by now still lists many vendors as unknown, but is starting to collect a number of vulnerable ones as well. Robert sent us a pointer to a paper titled "Socket Capable Browser Plugins Result In Transparent Proxy Abuse". The user (victim) visits somehow www.evil.com through his browser. If the transparent proxy intercepts this (it will), and if it resolves www.secret.com to it's real IP address and not 1.1.1.1 of www.evil.com (it might), it might just have connected the browser -thinking it's talking to www.evil.com- with a connection to www.secret.com. The browser will now allow the object from www.evil.com access to what comes in (and goes out) through the connection to www.secret.com, while it also still can communicate with www.evil.com. As a user: install Firefox and NoScript: as a user in e.g. a hotel that has a vulnerable transparent proxy this might be the only layer you'll get. By default, NoScript stops the objects from www.evil.com like all other scripts you didn't explicitly trust. As an administrator of a transparent proxy, check the US-CERT note above and if your vendor isn't listed as "not vulnerable", contact them for a solution. If you know other defenses that are effective, do contact us and we'll update.